NEW YORK--(BUSINESS WIRE)--Index Industry Association (IIA), a global organization of index administrators, today announced the results of a revealing new survey of its fourteen member firms that quantifies the total number of indexes available globally for the first time ever. According to the survey, there are 3.288 million indexes globally with equity indexes representing over 95 percent of benchmarks calculated. The survey, which was conducted as of June 30, 2017, sought information only about the total number of indexes administered by each IIA member. It is estimated that these indexes represent approximately 98 percent of all indexes globally available. 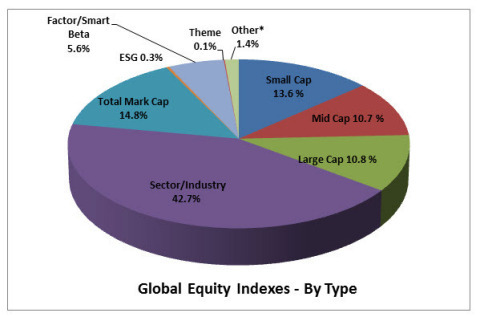 According to the survey, global indexes represent approximately 29 percent of the equity indexes available by geography. This is followed by APAC and EMEA, which each represent approximately 24 percent of equity indexes available, and frontier/emerging indexes (14%). The Americas have the fewest number of equity indexes, representing 9 percent of indexes globally. 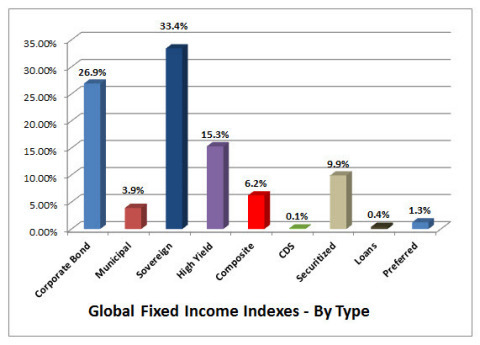 However, when looking at fixed income indexes by geography, the Americas represent approximately 33 percent of total indexes available. This is followed by EMEA (29%), global (25%), APAC (14%) and frontier/emerging (0.5%). A complete geographical breakdown by region and asset class is available on the following page. The other most common indexes, by asset class administered by IIA members, are based on commodities, foreign exchange and healthcare costs and collectively are less than one percent of all indexes. As mentioned, this is the inaugural analysis and the results will be updated annually. The amount of assets under management benchmarked to these indexes was not in the scope of this project as independent index administrators do not have complete access to this data. All IIA members separately submitted this information to the IIA and the IIA has not shared it among the members other than in the aggregate form made available to the public.